The New generation energy-saving technology and power on/off button enable its battery 9 months long and free you from the trouble of frequently changing batteries. With 1000 DPI high-precision invisible optical tracing engine, which is 2.5 times as precise as the ordinary optical engine, it can help you control more precisely. 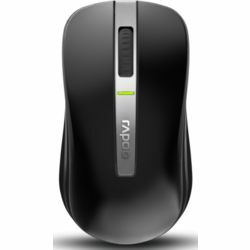 The default mode of the mouse is Bluetooth mode, but if you plug in the receiver it will switch to 2.4G mode automatically. It is the combination of popular wireless technology, which ensures the stability of wireless transmission The New generation energy-saving technology and power on/off button enable its battery 9 months long and free you from the trouble of frequently changing batteries. With 1000 DPI high-precision invisible optical tracing engine, which is 2.5 times as precise as the ordinary optical engine, it can help you control more precisely.